Pages of the Folding Bike, the Recumbent, etc. The explanations of this web site in English. My name is Hiroki Ono. I live in JAPAN. This page is written in English. Almost all the pages in this web site are written in Japanese. I wrote explanations concisely in this page. I have a folding bicycle. 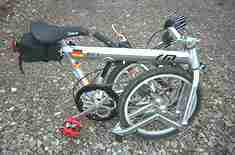 My folding bike is Birdy of Riese und Müller. In Japan, it is known as "BD-1". I love it. The contents of this web site are mostly folding bicycle information. The following are the links for the information of Birdy. Birdy Folding Bike Group <BirdyBike@eGroups.com> : A Site for people who own or are interested in the Birdy Folding Bike. 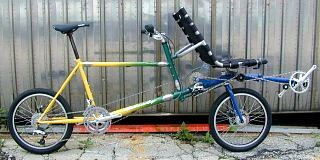 THE FOLDING BIKE BD-1(Birdy) page written in Japanese. MY FOLDING BIKE BD-1 (Birdy) written in English. This is my bike. My Birdy has 2 x 7 gear (14 speed). The Club for people who own or are interested in the Birdy Folding Bike. Recumbent cycles Information: Recuments Information and pages of my folding Sat R Day Recumbent of Bike Friday. The Club for people who own or are interested in the Recumbent. 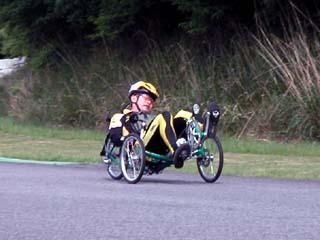 You can find the photo of 4 Sat R Day Recumbent riders. 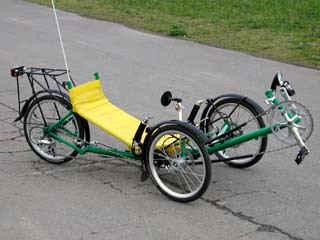 A semi-recumbent tandem with independent stoker pedaling. The Mugikusa pass: I crossed over this mountain pass by my folding bike. A Mugikusa pass is in Nagano prefecture. It is 2,127 meters above sea level. A MTB course in The Fujimi Panorama Skiing Ground. I rode rental MTB. The Fujimi Panorama Skiing Ground is in Nagano prefecture. Ride a slow train. Ride a Bike. Osaka -> Kyoto -> Ngano prefecture -> Niigata prefecture. The Honsawa hot spring is the highest spa in Japan. It is 2,150 meter above sea level. The Yourou glen. I went to cycling with my brother. He is a triathlete. The riding distance is 130 Kilometers. The Yourou glen is in Chiba prefecture. Also you can find a photograph of the Pacific in this page. The Shirakaba Lake and Karuizawa: I went to the Shirakaba Lake with my friends. Yukihime and Susumu are my friends. She and he have a folding bike. One of our purpose was to go cycling. But cycling was rained out. Next day, we went to Karuizawa. The Shirakaba Lake and Kauizawa is in Nagano prefecture. Cycle Tokyo! : The information of Cycling in Tokyo. 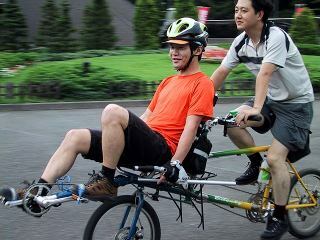 Welcome to Tokyo, and have a good time cycling here! JAPAN Cycling Navigator: The information of Cycling in JAPAN.